I live in an apartment and am fortunate to have a garage that comes with it. Outside the door to the garage are Morning Glory plants that are about 6 feet high I think. I grew up with Morning Glories so they bring back pleasant memories. 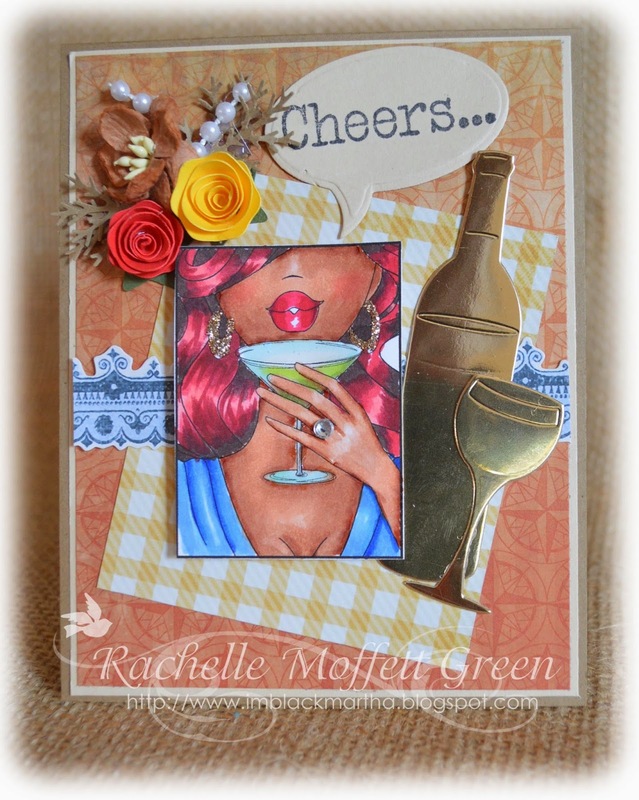 When I received my Frantic Stamper Vine Card Panel Die, I was so excited! First of all, I love these panel dies. They are so versatile. You can use them as overlays (which I did in this card), by themselves, in pieces on cards, as photo mounts for scrapbook pages. The uses are endless! Anyway, back to my story! 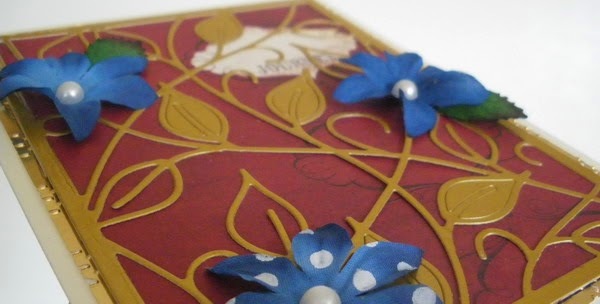 The Vine Card Panel die reminded me of those Morning Glories. So, I made a card that reminds me of the leaves and vines. As you can see, I used the panel as an overlay. I chose one of those papers that you don't know what to do with that has a pretty design in one corner. The vine panel is open enough so that you can clearly see the paper design underneath. I left in a few of the leaf solids (Is that what we call them? LOL) and added some flowers and a touch of pearls. I hope that you have a chance to get one of these card panel dies. They are just so much fun! I've been trying to have a go at creating less fussy cards lately, I really admire the clean and simple look and so I decided to have a go using the Chevron Card Panel Die, one that is quickly becoming one of my favourites! I cut this Chevron panel from a heavy Watercolour paper. To create the colour strip direct to the panel, I masked off the edges with a pair of post-it notes and it was then easy to add colour without worrying about any edges getting smudged. I chose to use a blending tool and rubbed Distress inks into the unmasked area. Once I took the post-it notes away, I had a colour block strip across a lovely clean panel. 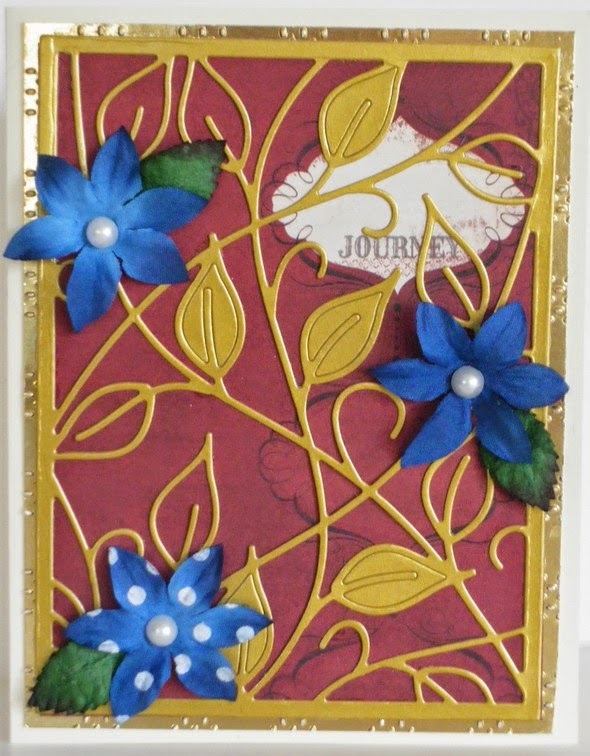 I then mounted it to my card and added a Chevron accent and a flower to finish. 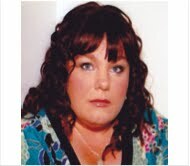 The best part of my card and my new Clean and simple look was that my card only took 30 minutes to complete! Perfect for me and my hectic lifestyle. I recently took an online class on using watercolors for card making. One of the techniques we learned involved embossing a die and then watercoloring the embossed image, The embossed image provides a guide for laying down the water color, yet gives a hand-drawn feel. I really couldn't wait to play with the technique, and this card is the result. Then, using a wet on wet technique, I watercolored the background. I let it dry completely. Next I watercolored the scooter using a wet on wet technique and drying between layers of paint and between changing colors. I trimmed the panel to fit on the card and layered it onto a black layer 1/4" larger than the water color panel in each dimension. I then affixed that to the card. I watercolored a scrap of water color paper light gray and die cut an Eiffel Tower from it. I watercolored another scrap blue and die cut "Bonjour". I added each to the card as shown. I hope you will give this watercolor technique a try. I think it is a lot of fun and gives wonderful results. *Note: I had a hard time figuring out the right sandwich for my eBosser. The published sandwich cut through even my heavy water color paper. I finally ended up with a good embossed image by using the magnetic sheet in place of the thin "B" plate between the C and D pates in the published sandwich. (D,magnetic shim, C, die, paper, rubber shim, A) If you want to do this technique you, too, might have to experiment, but start with the sandwich recommended for your machine. *** All materials for this project available at www.franticstamper.com. 5 x 7 Black Card Base, 4 1/2" x 6 1/2" white cardstock covered with Music Score Washi Tape. Spray sheet music with Tattered Angel Candy Apple Red Glitter Mist, sprinkle with Fairy Dust, let dry completely. Tear edges of music sheet, roll and distress. "I Love You" saying is from Kaiser Craft "Key To My Heart" paper series. Layer using black and white cardstock, wrap ribbon on top layer before adhering. Center the tag on the music sheet paper. Cut out Parisian Lamp Post (use bottom for base on birdcage). 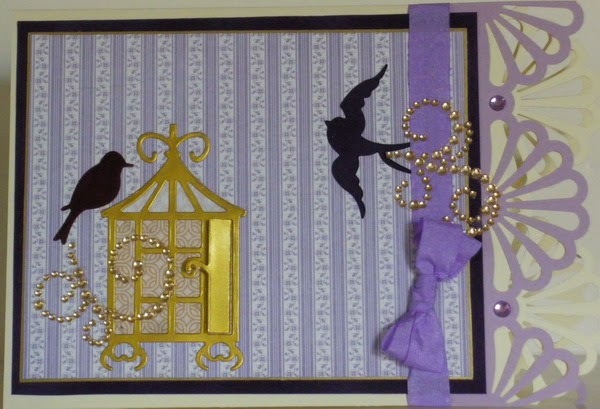 Cut out Gilded Bird Cage and adhere two pieces. Cut out Musical Score in black glitter paper and red foil, layer and adhere. Cut out Small Birds with red foil and silver glitter paper, layer larger bird for dimension. Adhere hummingbird to the cage. Make bow from black and silver ribbon, adhere Red Rose Cameo to center of ribbon. 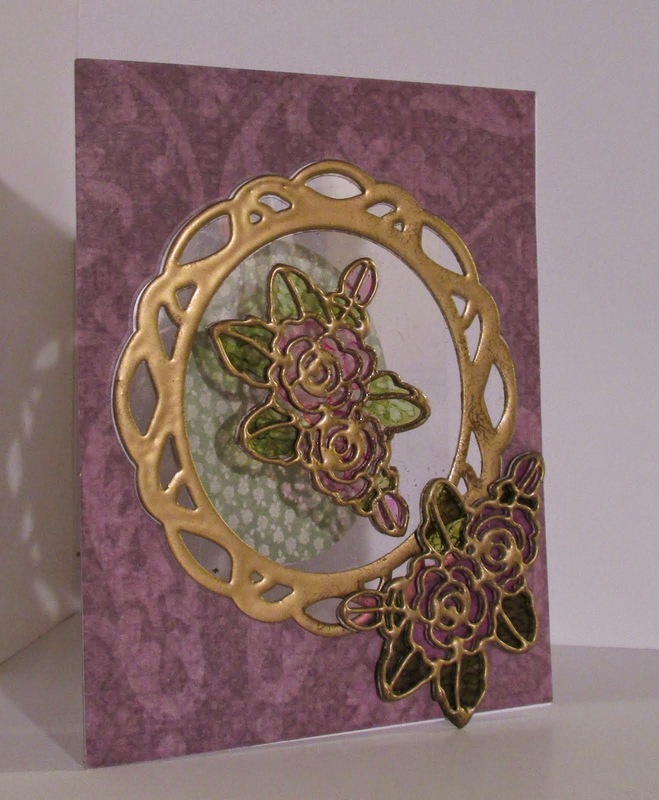 Using created embellishments add to card. Always move things around to get the best visual affect. Fran's dies are so fun to work with! A special thank you to both Fran and Kathy for their vision and accomplishments. Try them you will be so amazed at how your project looks. I really struggle with watercoloring. It may be that I am too impatient to let layers dry. It may be that I tend to "overwork" a piece, muddying it in the process. It may be that I am a control freak and letting the water and the paint decide the final result makes me a bit nuts. But it is most likely all three of the above! Lol. I am taking an online class on watercoloring in stamping. It has been wonderful watching the incredible instructors share their tips, tricks, and talent, but then comes time to try to do the "homework" and put it all into practice...and it kind of falls apart. But I think I did okay on this assignment on wet-on-wet techniques. I know it is still a bit overworked, but I did let it dry between layers (okay...I started to use a heat gun to help with that and almost burned my paper, setting off my smoke alarm in the process! 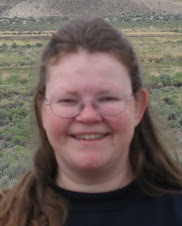 ), and I did manage to let the water do some of the work. I have to say I don't hate it. But I think the stamp had a lot to do with that! I just love this Frantic Stamper image. I stamped the image onto the smooth side of a piece of watercolor paper using peeled paint distress ink that I had stamped off once. I then used watercolors, water, and brush to color the image, working on one area at a time, ensuring not to paint near an area that was already wet so as not to cause the paint to bleed together. I applied clear water to the area first, then added color, lightly at first, and gradually building up layers and adding darker color where desired, drying between each layer of color. Here is a close-up of the flower. I do like the depth of color, the flow of the paint, and the shadows and highlights that I managed to get. I would say not terrible for a first-try, and I may actually get the hang of the technique in time! I trimmed the finished flower to 3 15/16"x5 3/16", mounted it to a navy blue panel that was 4 1/8"x5 3/8", and then mounted that to a standard sized card made out of heavy card-stock (watercolor paper tends to warp a little from wetting and drying so the heavy card-stock helps to keep it flat). A simple sentiment on a hand-cut flag finished the card. I hope you enjoyed seeing my card nearly as much as I enjoyed making it. I still have a lot to learn, but I am loving the process! Hi everyone! 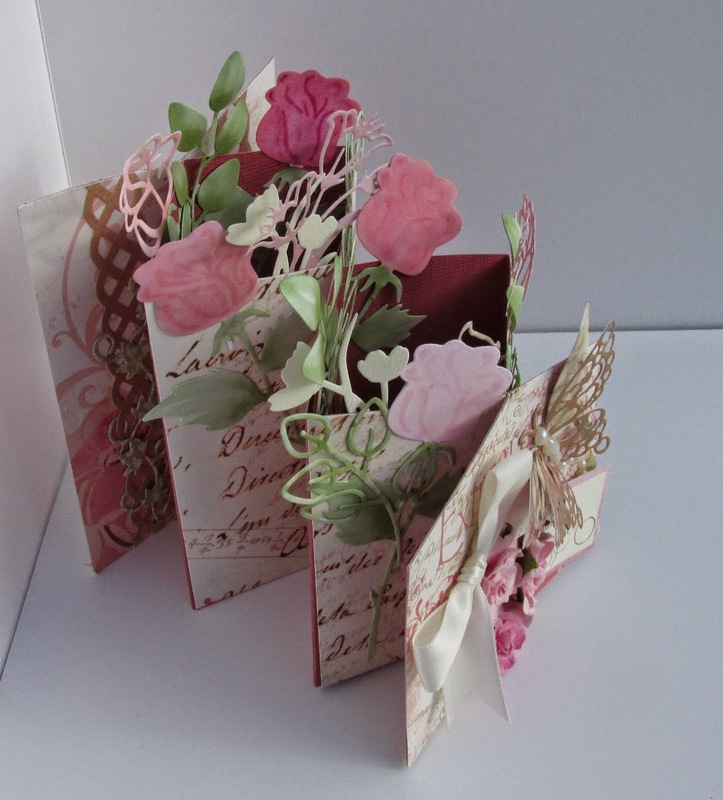 I was working on card ideas today and thought I would make a card using some new papers that I got from Graphic 45. Their papers are so nice, such a Victorian feel. I decided on lavender as the main color because that seems to emulate the Victorian era to me. I found this really great lavender stripe paper that reminded me of wallpaper. I had some purple suede paper and used that as the mat, and used an ivory card base. I have a Martha Stewart punch that is extra large. It's a challenge using this one on my cards because I usually only work in A2 size. Today I decided I just had to use it! I cut my card so that it would fit the punch design and punched the side of the card. It came out ok but I decided a second layer of the punch in lavender would be a good idea. I also use gold as a secondary color. (I even used some gold bling!) I cut out the Frantic Stamper birdcage die and a couple of birds too. You may not have noticed but the flying bird is actually the negative cut into the lavender pattern paper. It's not layered on top. The burgundy bird sitting on the cage is a separate piece of paper. I did this to create some dimension. I wanted to have an open bird cage door. I did it by using one of the die cut pieces, using mounting foam and reattaching it. It looks very cool! You can see in the picture below how I engineered it. I left a place on the card for a sentiment which I haven't added yet. When I was a child my wonderful mother would sometimes surprise one or more of her four children with a small gift or a special outing. There was no special occasion for these gifts; they were just for a "Happy Happy Day." Though today is Mother's Day, it is also a day I want to share a "Happy Happy Day" gift I have made for my daughter. She is in graduate school now, and in her first "real" apartment, the first place of her own, and she is trying to make it feel like home. I thought that a bouquet of spring flowers would add a nice touch. But since we are paying for graduate school, I also needed to be a bit budget conscious. I bought the flowers on sale when my local craft store closed, so all I needed was a special vase. Pretty fabulous, don't you think? I added the glass marbles, the "faux water" resin, and the flowers, and for a few dollars I think I have a pretty wonderful "Happy Happy Day" gift for my daughter. I can't wait to give it to her! 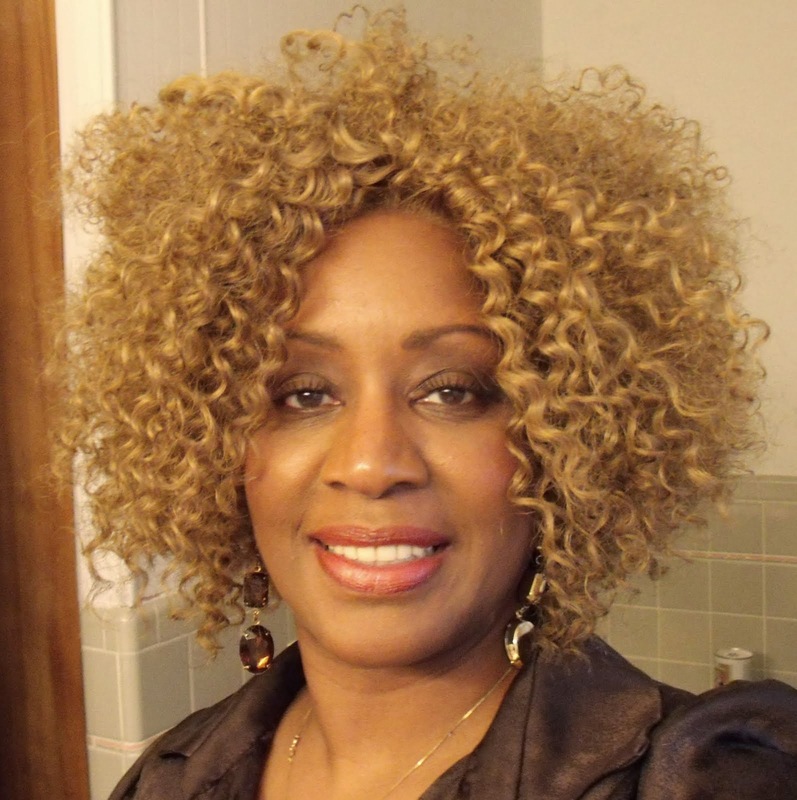 I hope you are having a "Happy Happy Day" yourself! *Some materials for this project are available at www.franticstamper.com. 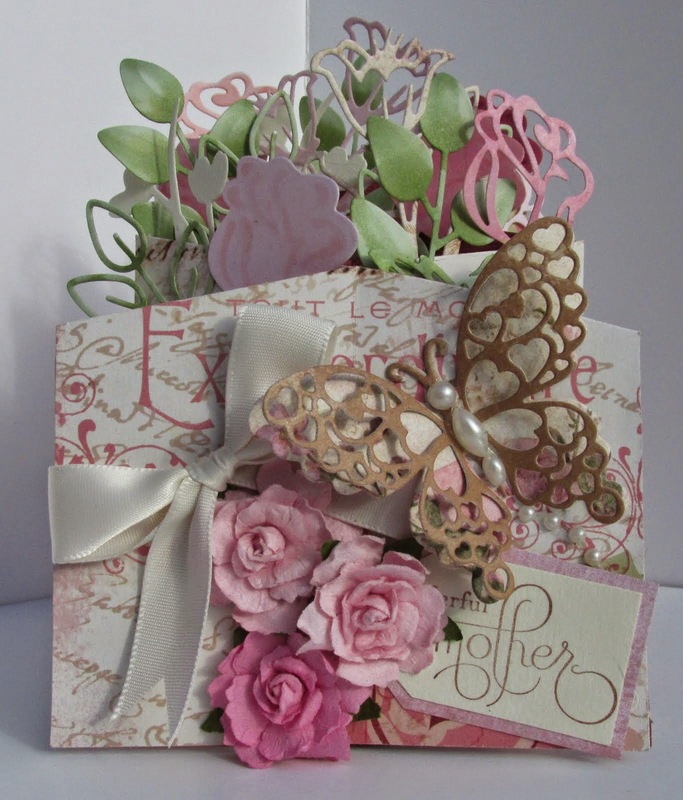 I try hard to make my cards for my Mom extra special because she is so very dear and special to me. 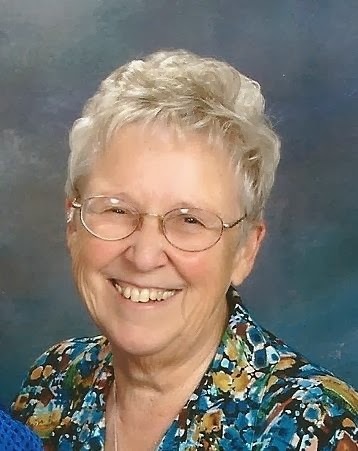 With her nearing 87 years of age, I know that each card I make may be the last one I get to have her enjoy, so I try hard to make each one a little more special than the last. She really loves my fancy-folds and pop-up cards, so the card has to have some kind of motion in it. And so far I have never had to repeat a card style or fold. I hope I can keep that going! This Mother's Day I wanted to do something floral. Mom doesn't like to get cut flowers because she hates to watch them wilt and die, but she does love the beauty of flowers. I think I have found a way to send her flowers that she can appreciate for as long as she wants. 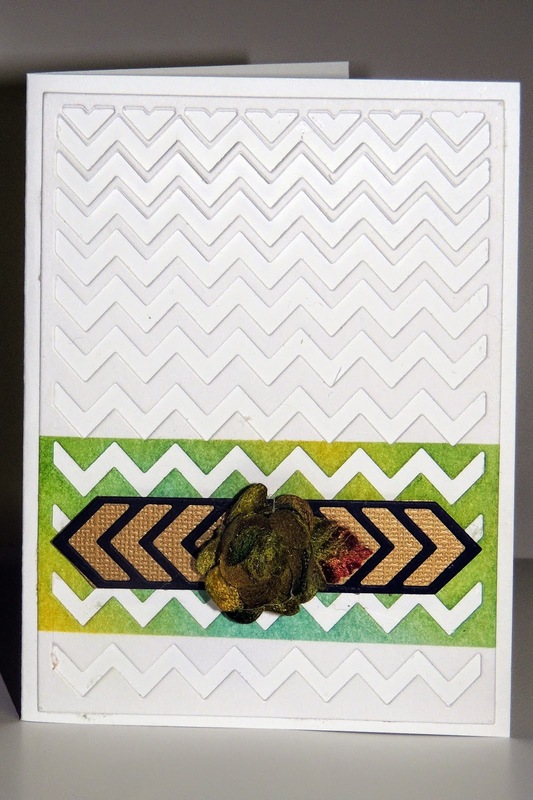 Recently Sharon shared a wonderful card here on the blog that pulled out accordion-style with two pieces that crossed each other twice. I loved that concept, but I wanted mine to cascade even more, so I decided to use a bigger piece of card-stock for my base and make the card a little narrower. I cut on the diagonal line, then I cut every other score line (2", 6", 10") on each of the two pieces; on one piece I started at the bottom edge and cut up to the pencil line, on the other piece I started at the top and cut down to the pencil line. I then put the two pieces together by aligning the slots and inserting one into the other. I folded on the non-cut score lines to form open boxes to allow my card to flatten. I wanted the card to be more sturdy and stable (the slits can slide around a bit) so I glued two 1" wide and about 3" and 4" long pieces of the card-stock (I just made sure they aligned with the bottom and didn't quite extend to the top), scored at 1/2", on the inside of the card where the slits met. I made sure that the slits and scores aligned so the card could lie flat and pull out perfectly. The reinforcing pieces had to be fit in there perfectly! I then cut pieces of my decorative paper (from Authentique) and glued in place on the sides of the card, trimming off the top to match the slope of the card (I found it easiest to cut them all to 2" x 5" and trim after gluing). I placed a 3"x4" piece on the front and trimmed it to fit the slopes. And finally I placed a 5"x4" piece on the back of the card. Well...it was finally time to decorate the card! All of the dies I used to decorate the card are Frantic Stamper Precision Dies. I die cut 4 solid Long Stem Roses and 3 of the open Long Stem Roses, 4 of the Spring and 3 of the Open Spring Sprig out of 80# white card-stock. I colored each of them with a variety of Copic Markers to match the color scheme of the card. I also cut a solid butterfly out of a coordinating patterned paper and a romance butterfly out of a coordinating solid color. I cut 2 tulip accents out of a coordinating ivory card-stock. And lastly, I cut 3 of the open pieces of the Easter lilly out of coordinating patterned and pink papers. I glued each of the pieces into place using a liquid glue. 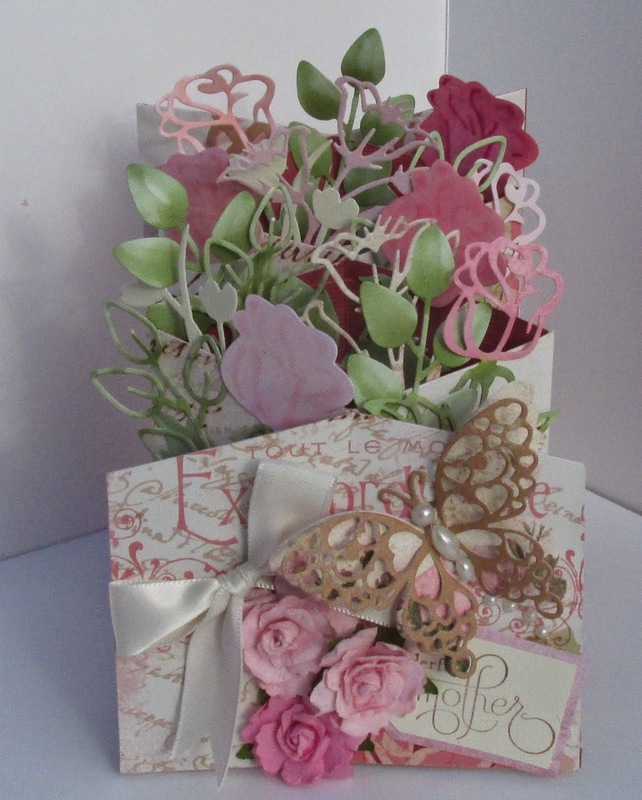 I added 3 paper flowers, a small tag with a stamped sentiment (source unknown) and a satin bow to finish the card front. Not pictured, on the back of the card I added a pocket to hold a hand written note and a gift card. 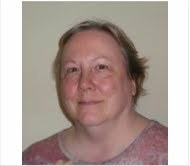 Mom got her card yesterday and enjoyed it a lot. I hope you have enjoyed it, too! I wish you all a very happy Mother's Day. *** Materials used available at www.franticstamper.com. 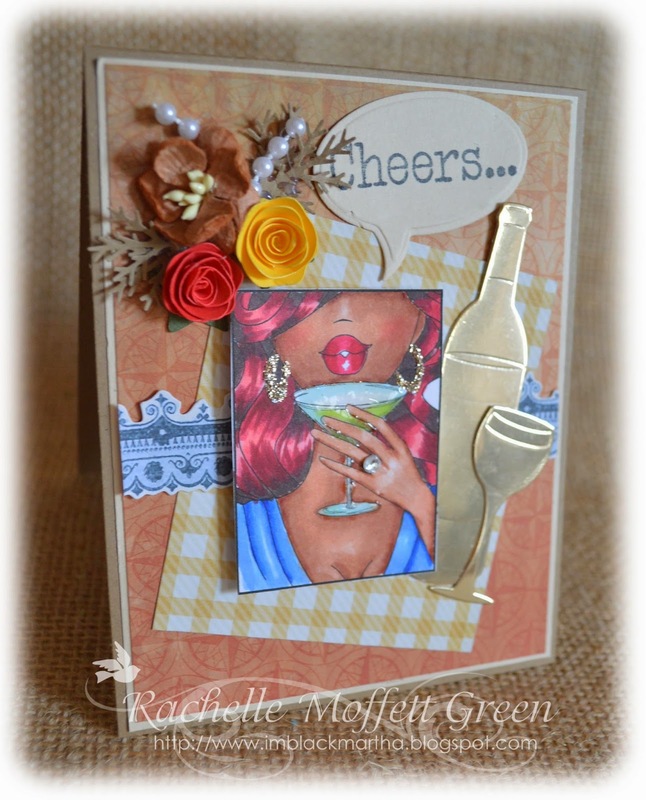 When I saw the "Wine Glass and Bottle" die I knew I wanted to use it with this image.With the "Cheers" sentiment, this card could be used for any number of occasions. I used foil paper cut cut the bottle and glass and it really makes it stand out. The flowers and pearls add an extra feminine touch without out being too "girly." I especially like the Kaisercraft "border" sticker. It's very subtle and picks up the color in the image.I've said it before and I'll say it again...Frantic Stamper has the absolute best dies on the market but don't take my word for it. Try them and you'll see what I mean. When I originally started drawing the Stencil Rose dies for Frantic Stamper, I simply thought of the die in terms of paper on paper, just like all the other dies I had drawn. I did think that it would be lovely cut and colored and layered onto the solid die, also colored, but I didn't really think much more about it until I actually got the die and cut it with it. Something entirely different struck me then...and I couldn't wait to make this card! 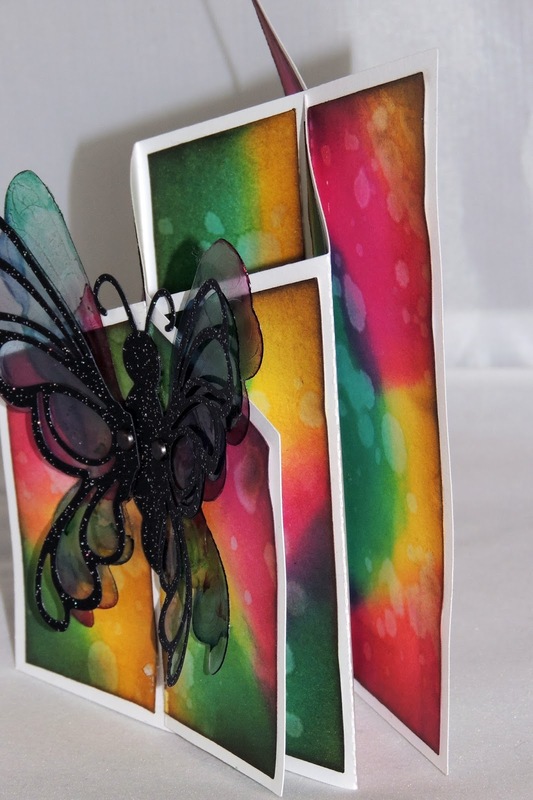 For some reason, I cut the die and all I could think of was stained glass, and I knew the PERFECT way to create the effect would be with acetate, card-stock, and embossing powder! Since I was going to be working on clear acetate I would need double of every element; one for the outside and one for the inside to hide any glue. So, I cut four of the detailed roses and two of the frames out of heavy white card stock. Using the direct to paper method I coated two of the rose fronts and the other two rose backs with Versamark ink. I added gold embossing powder, and heated. But the effect I was after needed a thicker layer of embossing, so I repeated the coating with ink and powder and the melting twice more. That gave me a layer that was thick and metallic-looking, which was just what I was after. I repeated the process for the frames, one on the front side and the other on the back. I then cut the frames out of the centers of patterned paper that had been cut to card size. I cut one of the sheets pattern up, and the other sheet pattern down. Lastly, I die cut the solid rose out of clear acetate. I then assembled the rose accent by carefully gluing one of the forward-facing roses to the front of this acetate piece. On the back of the piece I colored in the rose with Copic markers, tapping the color on rather than stroking it. I then affixed one of the two backward-facing roses to the back of the piece, hiding the back side of the first rose and creating a stand-alone stained glass accent piece. I was then ready to begin to assemble my card. Using a clear acetate card, I affixed the face-up patterned paper rectangle to the card front. I then affixed the forward-facing frame inside the hole in the patterned paper. Inside the frame I affixed the remaining forward-facing rose. Opening the card, I colored the rose on the inside front of the card with Copics as I had done for the accent piece. I glued the back-facing rose in place. I then glued the remaining frame aligned with the frame on the front of the card and then the remaining rectangular piece in place, as well. I applied glue to the back of the forward-facing oval, placed the oval glue-side up into the oval well in the frame on the inside of the card front, and then closed the card, adhering the oval in the correct place on the inside of the card back. I then glued the remaining oval in place over the other oval, on the back of the card back. 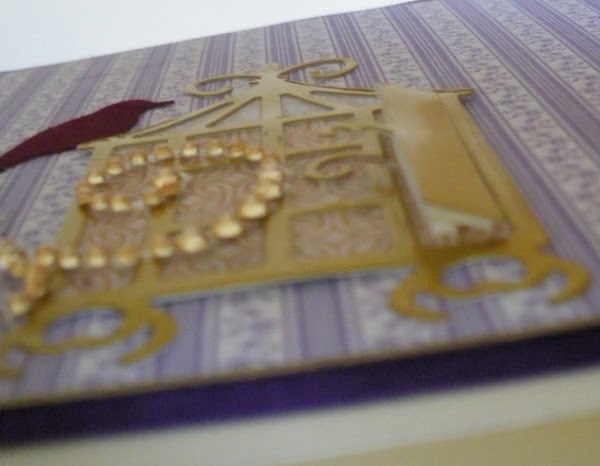 I then glued the accent piece in place on the card front (using Glossy Accents) to finish the card. 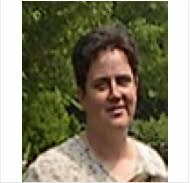 It is very hard to share the sense of depth that the clear card provides; the distance to the background that can be seen through the holes in the frame of the card is not discernible, and I am not a skilled photographer. But I promise you, in person it is quite dramatic! And the shine provided by the acetate truly gives a sense of stained glass. This technique has made me look at all of my dies that have a lot of cut detail in a very different light! I plan to try this technique with more of my Frantic Stamper Precision Dies; I hope you will try it too! 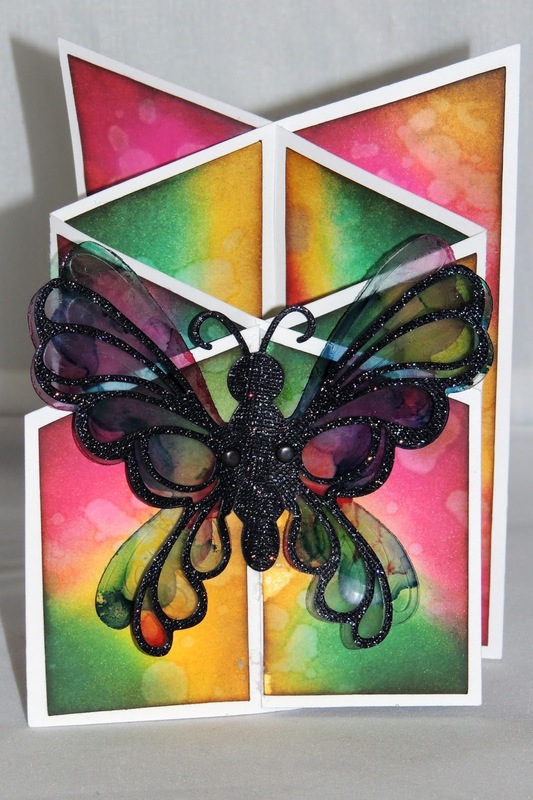 I created this butterfly awhile back and thought that it would be a perfect addition to the front of my stretch card. 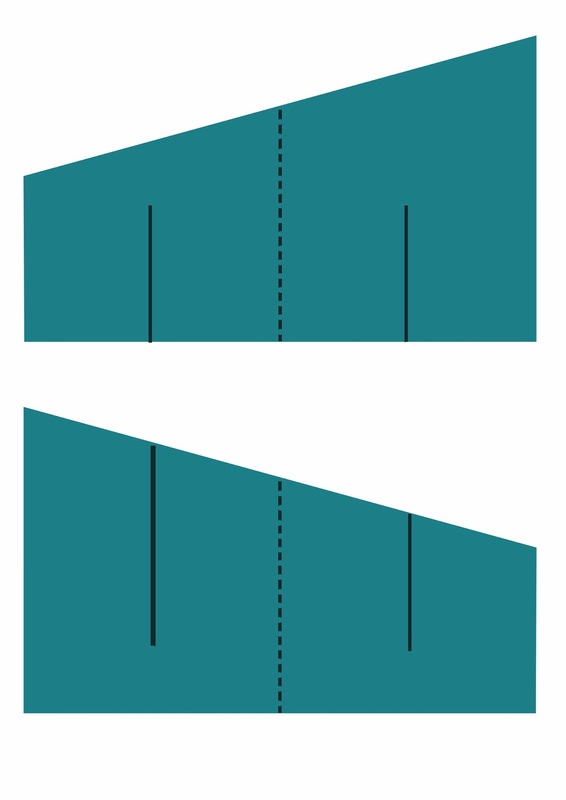 To create a stretch card use this template to cut out the two parts required, fold along the dotted line and cut along the solid lines. Slot both parts together using these cuts and flatten. I chose to cut additional pieces that could fit over each section of my card and decorated them by applying differentDistress inks to the surface. I kind of love how each section now looks like a piece of a butterflies wing! When I received this very cute die from the new Frantic Stamper Precision die range, I really wanted to have a go at making myself a sun catcher with it. I started by cutting the main section of the wings from a sheet of acetate, cutting two pieces for each wing. 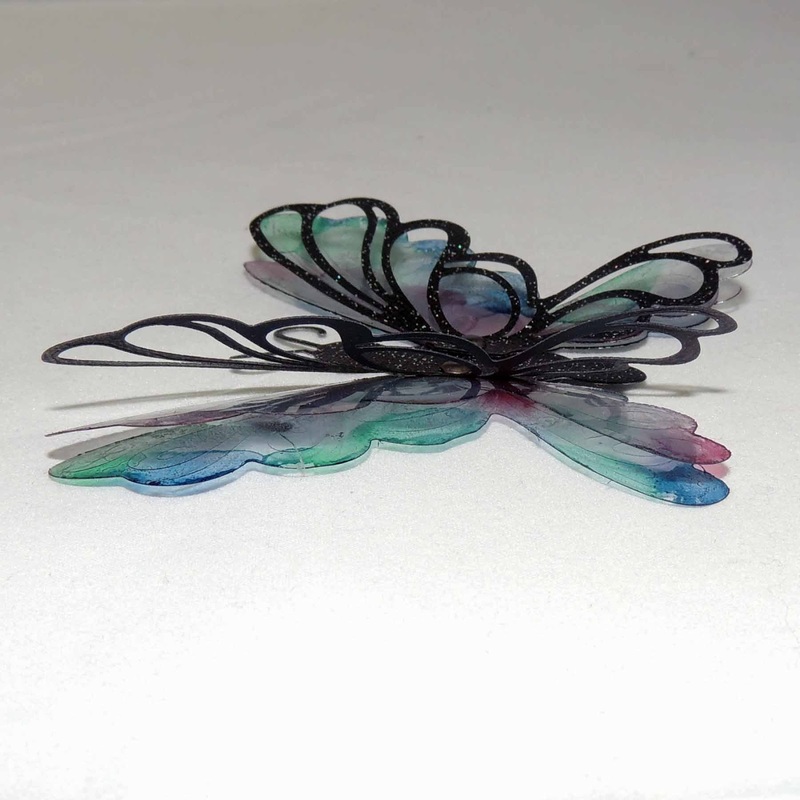 The set also comes with a second wing die that is very swirly and used this to cut a black wing border to mimic the black lead lines on stained glass. Once all the parts were cut, I used a blending tool and felt to apply a range of Alcohol inks to the surface of each acetate wing piece then joined each pieced together with a brad for each side using the pre cut holes. As one last feature, I went through each layer and bent them upwards slightly so that the wings had more dimension. 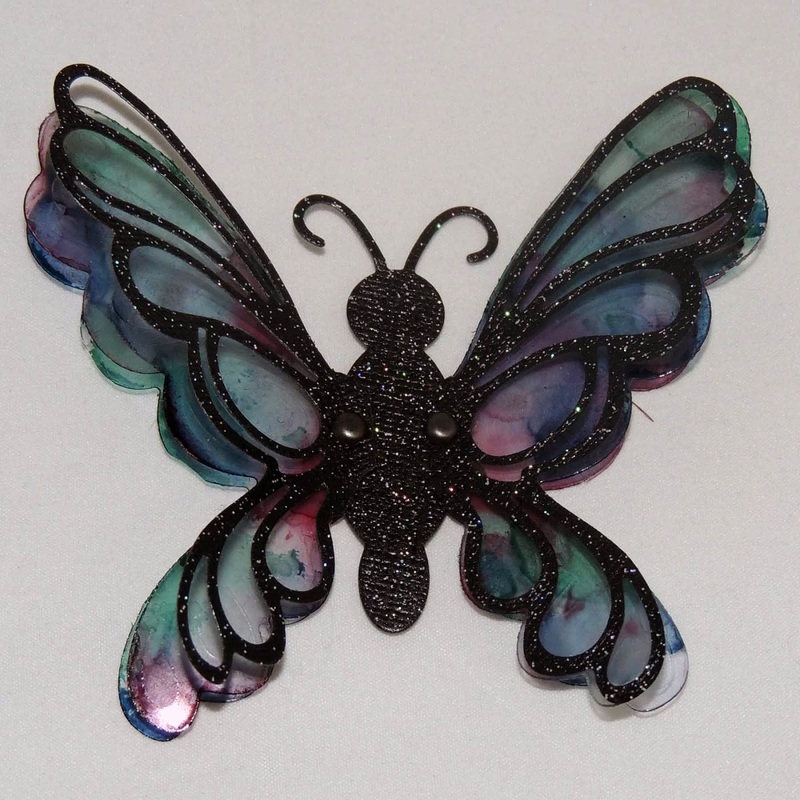 Check back tomorrow for a card using this butterfly!